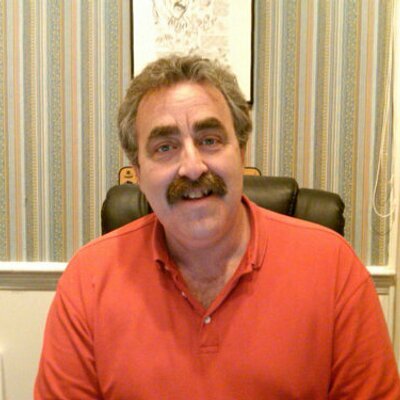 What’s up everyone and welcome to another blog here on BlueCollarBlueShirts.com. After my last blog, where I reviewed the Frank Boucher autobiography and talked everything about the current collection of Rangers, in today’s blog, we’re going to the past again, this time to the early 1970’s. To give you a quick preview and some thoughts, I am launching these two new sections of the blog, because I feel the New York Rangers and some of the other fan blogs out there, do a terrible job talking about the great players that wore the Ranger blueshirt sweater. Now, you have a place to check out some of the legendary players in Rangers history, all in one place. These two new sections have a dual purpose for me. For one, you may know me as the guy who’s been campaigning the Rangers to retire Frank Boucher’s #7 for years. I am hoping this is just another article to push my cause. Secondly, I wanted a one-stop page, where Ranger fans, young and old, can see all these names of Rangers greats. For older fans, this will be a trip down memory lane. For younger fans, this is a way for you to do your own research. In any event, while many of you know my thoughts about the present team and know my thoughts on the present goalie, let me also be the one that shows you the great history of this team. Of course, in addition, you can also find out more about Rangers history on this blog by visiting the BCBS Book Reviews and Delorean Blogs (Old School NYR Games Reviewed In the Present Day) sections. I gotta buy one of these for my Rangers collection. Gilles Villemure is a name that will bring a smile to the faces of older Ranger fans. For younger Ranger fans, the name Gilles Villemure may illicit a “WHO?” reaction. In “Gilles Villemure’s Tales from the Ranger Locker Room”, which is authored by Villemure himself and now Boston area scribe Mike Shalin, fans not familiar with Villemure will find out all about Villemure and those great Ranger teams from the early 1970’s. Unlike other books written by ex-players, this book isn’t really a Villemure autobiography. While Villemure does talk a little about his formative and pre-Ranger years, this book is a collection of stories from an era of Rangers history, which is kind of romanticized now. While the book is largely narrated by Villemure and his co-author Mike Shalin, for the most part, the book is chopped up into separate chapters, with Rangers from 1970-1975 chiming in. Aside from Villemure, the book also features chapters & stories from Giacomin, Stemkowski, Irvine, Gilbert, Park, Hadfield, Fairbairn, The Chief, Francis, Vickers and other Ranger players from this time period. The meat and potatoes of this book is 1970-1975, through the eyes of the people who wore the Rangers jersey from that era. If there is any true criticism of the book, it seems that some stories were repeated to a point of redundancy, in an attempt to get to the near 200 page mark. 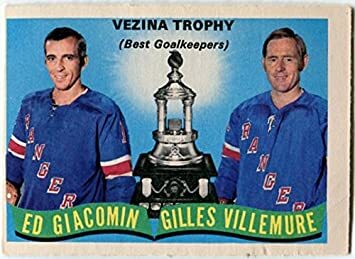 Kind of like Sean Avery’s book, where he tells you that his name was chanted at M$G 7676789678967896789678967896 times, Villemure tells you that he & Giacomin won the Vezina Trophy for the 1970-1971 season about 72857827394078958947 times. I guess if I won a Vezina, I’d be sure to remind you a bunch of times too. An OPC hockey card from 1972. For example you’re told the same thing in a myriad of ways. Peter Stemkowski was funny. Everyone loved Emile. Gilbert was one of the best. The GAG line was the greatest line in Rangers history. (Although, personally, I’d dispute that, and go with the Bread Line.) Villemure could’ve been a starter. It’s not that repeating the same stories over and over necessarily takes away from the book, it just seems you could’ve used the space to talk about something else. If anything, this book comes off like a transcribed symposium, with Villemure as your moderator. Villemure would talk about a subject, such as the Ratelle injury of 1972. Then, Villemure would hand the “written microphone” down the line and each Ranger would comment about the topic. If you can enjoy that concept, this book is a homerun. For me, the repetition isn’t bothersome to me as it may be for others. After all, I am seeking out Rangers history and this book is somewhat a collection of mini-interviews. This book gives you access to the minds and memories of numerous New York Rangers. It’s somewhat a good reference book, for me personally, when trying to learn about this era or for when I do the Delorean blogs from this time period. 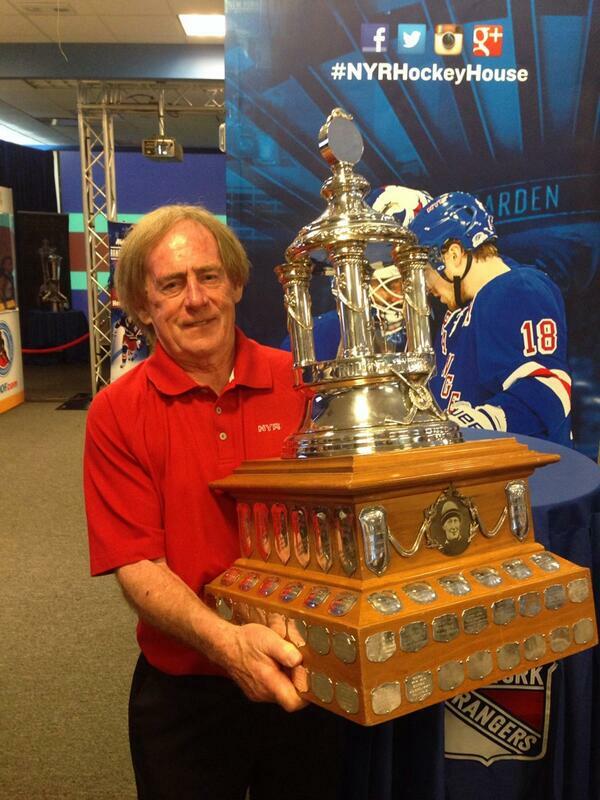 It’s funny, I look at this picture of Villemure holding the Vezina Trophy, nearly 45 years after he won it. What a thrill this must’ve been for him. This was probably the first time he held it since 1971. That’s gotta be a hell of a rush for him and a great moment for his family. Away from the Francis era of Rangers, Villemure lightly talks about himself, his big break and his love for horse racing. 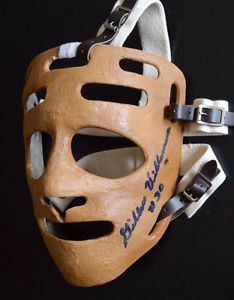 Like many other goalies from his era, Villemure was a victim of a 6 team league, and it wasn’t until the Great Expansion of 1967 and later, the inception of the WHA in 1972, which really opened the door for more players to play and get paid, at the professional level. For reference, Villemure only played 7 years and didn’t become a full-time NHLer until 1970, when he was 30 years old. There was no such thing as an NHL draft in Villemure’s day (At least until 1963) as he as given his C-Form Contract at 16 years old and that was that. Villemure toiled in the Rangers system for nearly 15 years, before joining the Rangers full-time. Also keep in mind, with only 6 teams in the NHL, hockey fans did follow other leagues. For Ranger fans, living in NY, they were most aware of the EHL and the AHL. That’s where Villemure spent some of his time and it’s where he shone. In today’s era, Villemure would’ve been a starting NHL goalie, but again, he was just a victim of his time, as he wasn’t going to bump Giacomin off the depth chart. 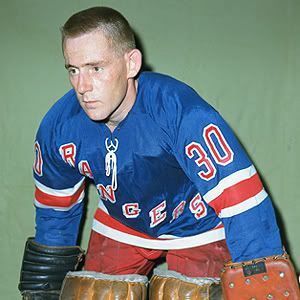 It wasn’t until Emile Francis took over, that the Rangers made their first Stanley Cup appearance since 1950, when the Francis Rangers made the SCF in 1972. For baby boomers, these were their Rangers and their first adult memories of the team. This era of Rangers also produced some of the best complementary players in Rangers history, such as Teddy Irvine, Jim “The Chief” Neilson, Peter Stemkowski and yes, Gilles Villemure himself. This period of time is also known for the biggest trades in Rangers history, with both trades featuring the Bruins as trading partners. Not ironically, this led to the end of the Francis Era. While one can argue who won the Espo/Vadnais for Park/Ratelle trade, (neither team won a Cup after the trade & the trade most likely benefited the Bruins more than the Rangers) no one can argue that the Rick Middleton for Ken Hodge trade of 1976, was a complete bust for the Rangers. In this Middleton/Hodge trade, where the Rangers lost big time, they gave up the younger & better Rick Middleton for Esposito’s old line mate, in Ken Hodge. Both of those trades are discussed in-depth in this book. To Villemure’s credit, despite having an association with the Rangers today, Villemure bluntly states that this trade was terrible for the Rangers. I think every Ranger fan will enjoy “Tales From the Rangers Locker Room”, as it brings you to a different time period and truly gives you an inside look at one of the better Ranger eras in Rangers history. There are now two versions of the book (First one being published in 2002 and an updated republished book in 2016, which I have not read) and you can get either on Amazon.com for cents on the dollar. As of this writing, there are 32 copies left on Amazon, with the cheapest book being $3. For $3 and for two or so hours of reading entertainment & knowledge, you know you’ve spent $3 in worse ways. For $3, this book is worth having in your collection. I’m glad I bought it and thoroughly enjoyed Villemure’s account of this era. Overall, while you may find yourself reading the same story being told 3674376734 different ways at times, this is an enjoyable book & I’d recommend it. Again, I’m making light of some of the redundancy, as this book had more of a “symposium” feel to it, than anything else. For young fans, you owe yourself the service about learning of the greats your parents or maybe your grandparents grew up with. For older fans, you will love this nostalgia. 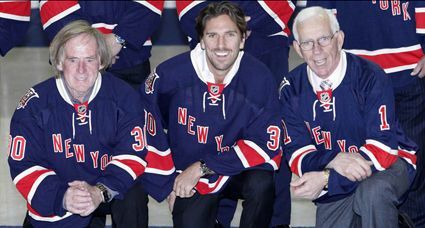 Up next on BlueCollarBlueShirts.com: Rangers news as it comes in, book reviews and a Delorean blog. If I’m feeling ambitious, I may launch a new flashback section of this blog, examining the most famous & infamous trades in Rangers history. After reading this book, two trades are fresh in my head! As always, thanks for reading and….